Here are the three darks, Noir is a rich, sparkly black, Mirage is a matte, slightly flattened grey-brown (it’s not quite a taupe, but it’s not as red, nor as sparkly as Guerlain’s “Brun” shade), and Oriental Metal is the most beautiful lightly metallic taupe-shade, which has very quickly become a staple in my daily make up. It’s a flesh-coloured powder with a light hint of iridescence, you use it in the same way you use the other kohls (a quick swipe along the waterline with the stick), and instead of darkening and defining the eye, it lightens and brightens your eyes, by getting rid of any residual pinkness. It’s VERY easy to overdo though. Very, very, very easy. This doesn’t look too bad in the photo, but I spent all day boggling at how “odd” my eyes looked. I’m not sure I’ll use Secret Glow again for a while – it was just too different – or at least, I might try and see how I can use it to get a slightly lighter application. I’ll say this for it, it’s got some MEGA-staying power! The Fine Print: I bought these, and I loved them so much I’ve bought them for other people too. Don’t fear the stick, people! You're tempting me again! The oriental metal looks like such a beautiful colour I want it, in fact I must just get on and order it. 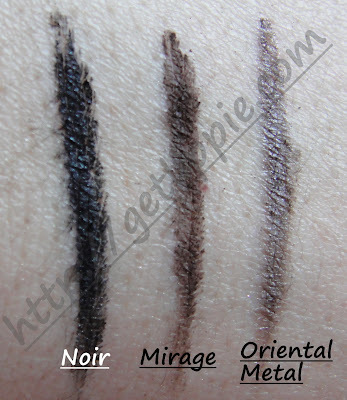 I am desperate to get my mitts on Noir, Brun, Mirage and some of the older discons, like pourple and oriental bronze. I even fancy Laguna a little bit. I think Secret Glow looks great in that pic, but like you say it's incredibly easy to overdo! Love them. I love the look of Secret Glow, it really opens up your eyes! Can't comment on it looking 'weird' though. I want Guerlain Secret Glow so badly that I am willing to sell some of my blood to get it. It is near impossible to find. Thank you for your loverly review and for again reminding me I am a failure at life for not owning Guerlain Secret Glow kohl. I aims to please, Elvira!